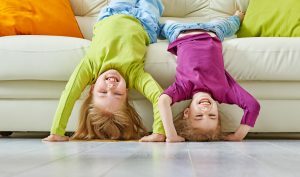 Children’s Chiropractic: Does it work? Chiropractic treatment for a child is considerably different to that for an adult. We look after children of all ages from newborns to teenagers and of course through to adults. Spinal adjustments are adapted to the unique bio-mechanical features of the paediatric spine. The force delivered is far less; techniques are modified and reduced in pressure to suit the age and level of development of each individual child. We also incorporate other techniques such as soft tissue work, cranial work and movement exercises. Research and clinical experience has shown a high rate of improvement with children’s chiropractic care in respect to the presenting complaint and additional beneficial effects unrelated to the child’s initial clinical presentation 4. In a 3 year retrospective study in England, 85% of parents report improvement in their child undergoing chiropractic care 5. The evidence, so far, is that manual therapy for the paediatric patient, in the hands of a skilled chiropractor, has a very low risk. The negative side effects of paediatric manipulation are rare and mild 4-6. Hayden Ja, Mior SA, Verhoef MJ. Evaluation of chiropractic management of pediatric patients with lowback pain: a prospective cohort study. J Manipulative Physiol Ther. 2003 ;26(1):1-8. Alcantara J,Ohm J, Kunz D.The safety and effectiveness of pediatric chiropractic: a survey of chiropractors and parents in a practice-based research network. Explore (NY). 2009 Sep-Oct;5(5):290-5. doi: 10.1016/j.explore.2009.06.002. Miller JE1,Benfield K. Adverse effects of spinal manipulative therapy in children younger than 3 years: a retrospective study in a chiropractic teaching clinic. J Manipulative Physiol Ther. 2008 Jul-Aug;31(6):419-23. doi: 10.1016/j.jmpt.2008.06.002. Vohra S, Bradley C, Johnston KC, Humphreys K: Adverse events associated with Paediatric spinal manipulation: a systematic review.Pediatrics 2007, 119:275-283. Scoliosis: Why Chiropractic should be your Treatment of Choice Overtraining. How Much Training is Too Much?